This heavy duty Magnum® drill is built for industrial/construction applications. 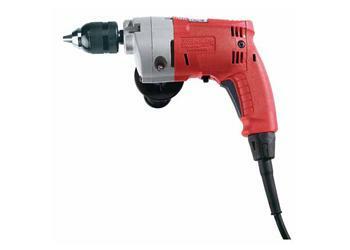 It features raw power with a Milwaukee built 5.5 amp motor, 0-950 rpm trigger speed control, reversing, and a QUIK-LOK® cord that can be quickly removed from the drill for storage or service replacement. Another exclusive feature is the brush cartridge system, with a set of spare brushes, that allows you to change brushes in less than one minute. Use this tool with a variety of accessories to drill into wood, metal, plastics and composites. The keyless chuck makes accessory changes quick and easy.